The Myers Verde Company is a sustainability consulting firm offering a wide range of consulting services for businesses and government organizations, providing compliance documentation and strategic planning to meet local and federal sustainability and energy efficiency goals. In partnership with Sandia National Laboratories and funded by the Federal Energy Management Program we provide technical assistance, expert guidance and training to assist all Federal agencies comply with the Guiding Principles for High Performance Sustainable Buildings (HPSB). Contact us for training, 3rd party review and technical guidance. 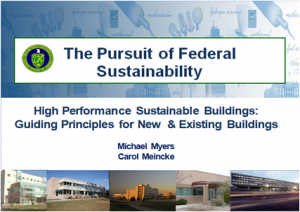 Does your building meet the Federal Guiding Principles? Executive Order 13514 requires at least 15% of each agency’s existing facilities and building leases (above 5,000 gross square feet) to meet the High Performance and Sustainable Buildings (HPSB) Guiding Principles by the end of fiscal year 2015. To meet this goal, most agencies must upgrade at least some portion of their existing building stock. A separate set of HPSB Guiding Principles were developed for new construction and existing buildings. 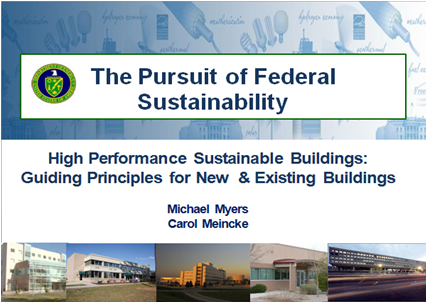 The HPSB Guiding Principles for Existing Buildings has been incorporated into the Federal High Performance Sustainable Buildings Checklist (or Guiding Principles Checklist), now available through EPA’s ENERGY STAR® Portfolio Manager, an interactive web-based tool that allows users to track and assess energy and water consumption across entire building portfolios. Who should attend: Anyone involved in the operations, design, construction and the maintenance of federal facilities and the purchasing or procurement of products. Gain a detailed understanding of the HPSB Guiding Principles for Existing Buildings. Learn the basic steps to use EPA’S Portfolio Manager and the Federal HPSB Checklist embedded within Portfolio Manager to track progress and document compliance. Receive guidance and solutions to help agencies comply with the HPSB performance requirements. Learn about alternative financing to implement energy conservation and sustainability measures without using appropriated dollars. 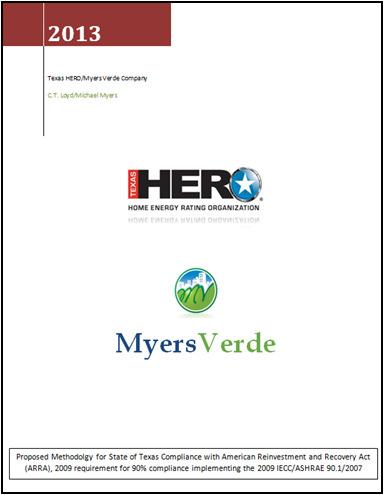 Myers Verde Company and Texas HERO have prepared a draft paper on how Texas can demonstrate energy code compliance. Call for a copy. Mike Myers has been a valuable asset to the development of Sustainable Policies and the Green Building Program in San Antonio. His knowledge nationally and regionally was a key component in his ability to facilitate the strategic development of the Mission Verde Plan for San Antonio.